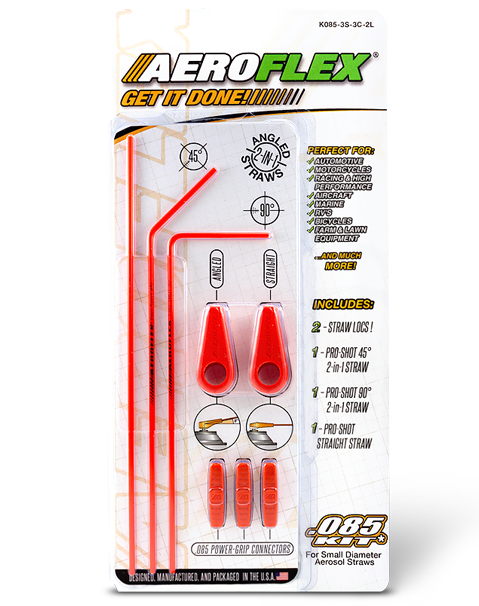 Aeroflex® Kits are available in two unique diameter sizes and come in a variety of combinations that include our Straw Loc’s, Pro-Shot Straws and Power Grip Connectors. With options designed specifically for the Professional Mechanic, Field Technician, and the at home Do-It-Yourselfer. So whether your job is on a professional race team, the restoration of a classic muscle car, tackling the repair on an oil rig in the blazing heat of the west Texas sun, or simply fixing your child's bicycle, Aeroflex® not only has the right kit for you but a kit that will save you time and money! Click the More Info icon below to read more about these amazing new products! Individual packaged items available soon. Click on Aeroflex® Kits to order product now. Straw Loc. The name says it all. No more limitations. No more worrying. Regardless of the aerosol penetrant you work with, that “little red straw” is never coming off the nozzle again. With its patented technology, the Aeroflex® Straw Loc offers you versatility and a security you’ve never known before. Never waste time or money again with unnecessary engine teardown retrieving a straw. Any concerns of a straw blowing off into a cylinder bore or intake runner is a thing of the past! Now clean fuel rails and throttle bodies, carburetors and gas lines with zero apprehension. And that’s not all. Aerosol cans can now tumble from any height onto any surface without the straw becoming dislodged from the nozzle. From an automotive fender to the cab of a big rig, even a fall from a ten story construction platform, the straw will remain locked to that nozzle. Guaranteed! Straw Loc is available for both straight and angled nozzles. And like all Aeroflex products, Straw Loc works with both the Pro-Shot Straws and Power Grip Connectors. Available individually or in Aeroflex kits. The Aeroflex® Pro-Shot Straws feature a proprietary two-in-one design and allow you to easily reach around pass or through any angle distance or obstruction. Available in two different diameters so whatever your preferred brand of aerosol penetrant is you can now precisely controlling exactly where it goes. And when linked together with the Aeroflex® Power Grip Connectors...well as we like to say around here: Nothing Is Out Of Reach! Aeroflex® Power Grip Connectors erase any limitations that would keep you from reaching that rusted bolt, seized bearing, or binding part regardless of its location or obstruction. Innovating engineering is at the heart of the Power Grip Connectors patented micro fluid transfer system. This unique system allows the air/fluid mixture of your favorite aerosol penetrant to flow seamlessly from one straw to the next. And when connected to the Aeroflex Pro-Shot Straws, maneuvering around steering linkage or behind grills, reaching through frame rails, or getting into tight, confined spaces in engine compartments become a quick and uncomplicated task. 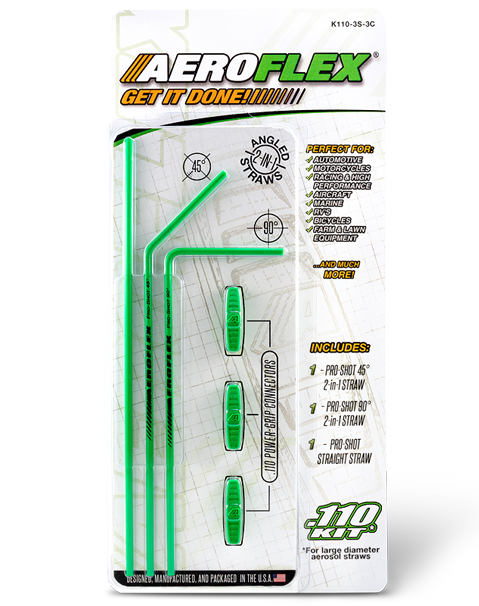 Aeroflex® Power Grip connectors come in two sizes, green connectors link larger diameter straws together while the orange connectors are designed for smaller diameter straws.